Is there any way to set notification settings on a thread by thread basis? I prefer to receive notifications in general, but I don't necessarily want an email every time someone comments on a popular thread I've participated in. 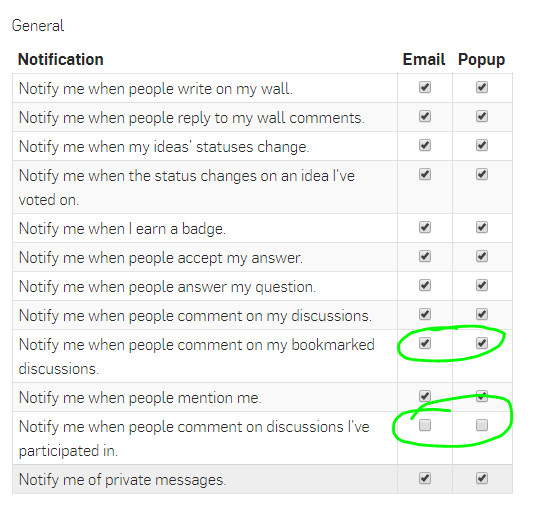 How about turning off notify on discussions, then turn on bookmark notify. The star at the top right corner of the thread is the "bookmark" button. Yep, I knew about bookmarks. Like I said, notifications are generally fine, so I don't really want to bookmark everything. I just wish there was an "anti-bookmark" option. Oh well.